Crayon Box Quilt Studio: Penelope is gunna get all fancied up! Penelope is getting a house call spa treatment in a few days and I can't wait! Deciding to get her upgraded has been something I've been thinking about for quite a number of months. I've read tons about the upgrade on the Hinterberg Owners Yahoo Group (all great) and I've been emailing back and forth with many Voyager owners that have gotten the upgrade and they all say "do it". I've been hesitant to spend the money but in the end, it will be so worth it. This is what my Penelope looks like now. 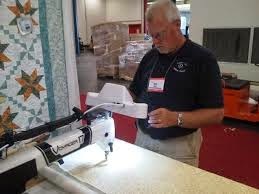 This is Steve Dekkr of Dekkt Out Quilting Supply. He is the developer of the Dekk't Out Quilting System. He's the one that will visiting all the way from Florida in a few days. 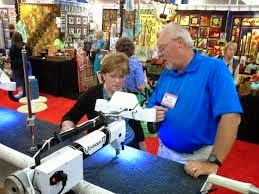 This picture is from the International Quilt Market in Houston in 2013 where he was showing someone the new upgrade available. You can see that it will have an entire new look and a complete new electrical system. Penelope will get these fantastic new Ram handles with push button controls, such a huge difference from her current set up. Steve changes out practically everything on the machine except for the motor. She will have a new needle up/down (her currently one won't work right) a fantastic stitch regulator with 5 different stitch modes (Equate Regulation, Basting, Cruise, Ruler and Robotic), a front facing laser so that I can do pantos from the front of the machine (bye bye old flexible lamp) and will also enable me to push the frame back against the wall and gain back some studio floor space plus all of this will come with a new 5 year warranty. 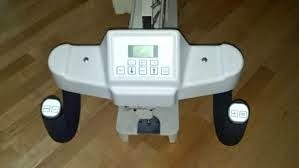 This is going to be life changing for her and will turn her into one of those fancy machines but at a fraction of the cost. I know that my problems with Penelope will be gone, my frustration will disappear and I'll be able to concentrate on practicing my quilting and finally getting my quilts actually finished. Then once I feel that my skills are where they should be, I'll be able to start quilting for others. And just so you know, this upgrade is available for many other models of machines besides the Voyager 17. Take a look at their website and see for yourself. I promise to take pictures of the after to show y'all and then I'll be on my way to some great quilting time. Steve's visit can't come soon enough. I need a makeover like that!!!! Have fun. I'm so excited FOR you!!! It will be worth the investment for sure! ohhh I thought she was being stretched but she's just being made over, will that make such a difference, have u got a stitch regulator now ? Sounds like Christmas is coming early! Hope everything goes well and that you will have Penelope to full capacity in no time! 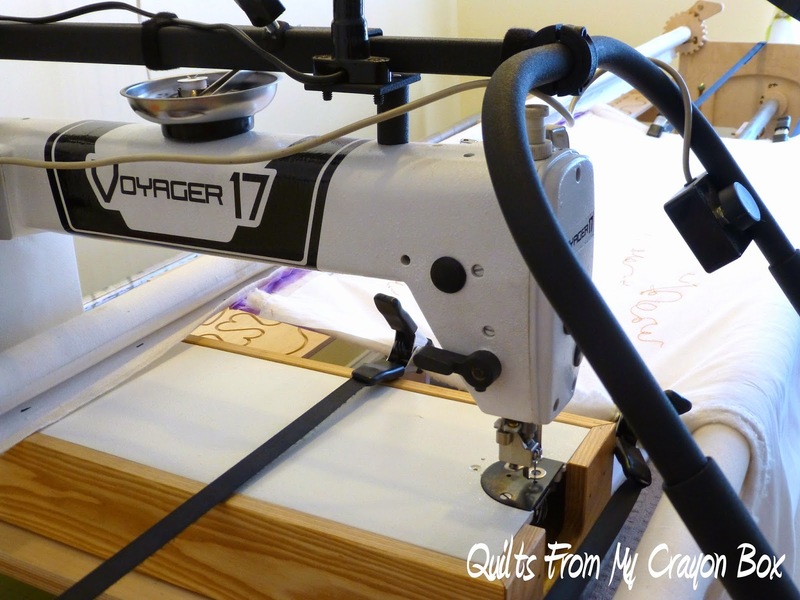 Have you been quilting much yet...wondering how it's going for ya?